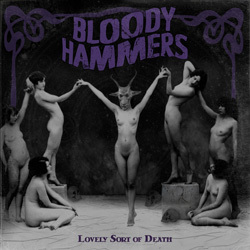 Never a band to stand still since announcing their arrival on the scene in 2012, Bloody Hammers’ third ‘real’ studio release (ie ignoring the odds ‘n’ ends outing ‘Spiritual Relics’) ‘Lovely Sort Of Death’ sees main man Anders Manga taking his ghoulish musical vehicle firmly into goth metal territory once dominated by Sisters Of Mercy. Maybe this should come as no surprise, seeing as the latter part of its predecessor ‘Under Satan’s Sun’ seemed to imply that he was heading in that direction, but if you were expecting the heavy, doom-laden riffs of the self-titled debut Manga’s latest offering will leave you standing at the corner of Detonation Boulevard. There’s an honest integrity to whatever is released under the Bloody Hammers’ banner and this latest ten-song set is no exception. The material has an organic, ethereal quality – as if it was born of nature rather than created by man – and despite the shift in the musical focus there’s no escape from the pervading atmosphere of fear and shock that Manga and his partner Devallia are so good at imbuing the material with. The songs draw on the primal desire to be scared that film-makers have exploited since Frankenstein’s Monster lumbered backward onto cinema screens back in 1931, and the fact that you can easily tap your feet along to the beat doesn’t alleviate the increased heartrate and skin-crawling fear that the likes of ‘Messalina’ and ‘Bloodletting On The Kiss’ arouse – it’s pretty much the soundtrack to your very own horror film. Elsewhere, ‘Infinite Gaze To The Sun’ is about as good as it gets, its beguiling refrain and memorable chorus making for an accessible and catchy little critter, and ‘Ether’ looks back to the heavier days of Sabbath stomp with a time change that could have come off ‘Master Of Reality’. Forever evolving will almost certainly leave some fans behind, but in doing so Bloody Hammers remain fresh and vital and reassuringly exciting.